Herbicides prevent or eliminate weeds and thus replace or reduce manual and mechanical weeding. As weeds compete with crops for sunlight, water and soil nutrients, herbicides can also prevent soil erosion and water loss. Rifit 50 EC is a pre-emergence herbicide for control of grasses, sedges and some broad leaf weeds in transplanted Rice. It contains ‘Pretilachlor’. It provides excellent selectively on all known varieties of Rice. No adverse effect like stunting or yellowing of crop, rather gives greening effect to the crop. It belongs to chemical class, Chloroacetanilide. Time of Application : 0 to 5 day after transplanting. Water management is very important. Gramoxone 24 SL is a leading non-selective post emergence fast acting contact herbicide. It contains ‘Paraquate Dichloride’. It acts in presences of light & desiccate green plant parts. Site of action is in the chloroplasts. Unique benefits ~ quick kill, controls wide spectrum of weeds, rain fast, inactivated on contact with soil, prevents soil erosion and cost effective. Dose : 500 ml / acre. It contains Pinoxaden 5.1 %. It is post emergence selective herbicide for wheat crop. It controls phalaris which is a key weed of wheat crop. It is very safe to crop. Application time – 3-5 leaf stage of weed. Dose/acre – 800-900 ml /ha. It is post emergence selective herbicide for the wheat crop. It controls phalaris which is a key weed. It is very safe for the present and subsequent crop and is very effective in all weather conditions. It contains Pretilachlor 37% EW. It is pre- emergence selective herbicide for transplanted rice. It controls grass, broad leaf and sedge weeds. It is very safe to crop. Application time – between 0-3 Days after transplanting. Dose/acre – 600 ml /acre. It is a pre- emergence selective herbicide for transplanted rice. It controls grass, broad leaf and sedge weeds. Rifit Plus dissolves and spreads fast and has an effective action. It is convenient to use and safe for the crop and environment. It contains Fluazifop-p-butyl 13.4 %EC. It is post- emergence selective herbicide for Soybean, Cotton and Ground Nut. It controls key grass weeds and very safe to crop. Application time – 3-5 lead stage of weed. Dose/acre – 400-500 ml /acre. It is post- emergence selective herbicide for Soybean, Cotton and Ground Nut. It controls key grass weeds and is very safe to crop. Fusiflex gets quickly absorbed by leaves and translocates. It performs well in all weather conditions. 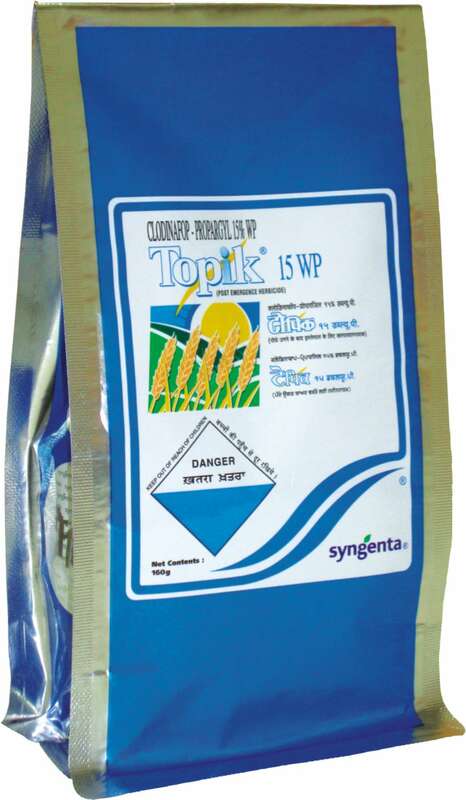 Topik 15 WP is a post emergence selective herbicide for control of resistant Phalaris minor and Avena fatua in Wheat. It contains ‘Clodinofop Propargyl’. It is a contact herbicide, hence to be applied when majority of Phalaris and Avena has emerged & is in actively growing phase. It is absorbed through the leaves & shoots. It has no harmful effect on Wheat crop and the following crop leading to higher yields. Dose: 160 gms/acre. Herbicides prevent or eliminate weeds and thus replace or reduce manual and mechanical weeding. As weeds compete with crops for sunlight, water and soil nutrients, herbicides can also prevent soil erosion and water loss.